One of the coolest things about being an Influenster are the brand challenges. Whenever you qualify to receive a VoxBox, for each/or some of the brands in the box, you perform different tasks that pertain to the item. You unlock a brand challenge badge if you complete all of the specified Influenster and social tasks for the item. You also get the chance to win some amazing products from the brand, which is super awesome. About a month ago, I found out that I had won a Kiss brand challenge from Influenster's Spring Fever VoxBox program (for the broadway nails imPress Press-On Manicure). I was super stoked when I found out that I had won! I received my Kiss challenge prize in the mail a couple of weeks ago and I am so grateful for all of the Kiss items that were included in my prize pack. 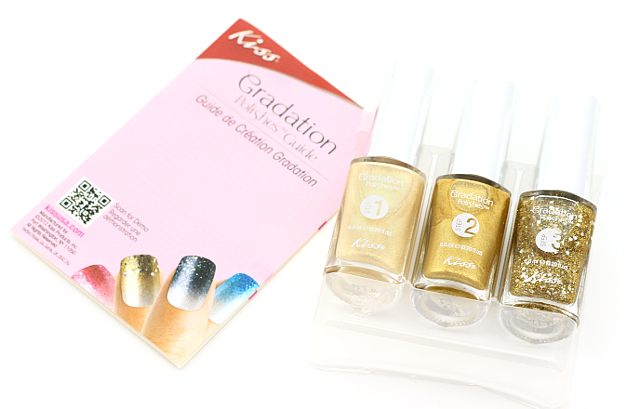 I received the gradation nail polish kit in exposure, a pair of lashes, and a strip lash adhesive. Gradation Polishes (Exposure): This shimmered/glittery golden trio helps create a super fun, faded ombre manicure in just three simple steps. First you apply two coats of the lighter gold (step 1), then apply one coat of the darker gold (step 2) just on 1/3 of the nail. Before that darker gold dries, take the gold glitter nail color (step 3) and brush a coat of that on 1/2 of the nail. And that's it! It couldn't be anymore simple. Each of the polishes had nice formulas, and they were easy to apply. I am not usually one for gold nail colors but I have to admit, the gold shades in this kit are very pretty. And the subtle ombre effect makes these that much more interesting and refreshing. I can see this mani being sported a lot in the holiday season. Love! Eyelashes: These lashes are certainly different from others I have tried. They contain built in applicator strings which help make application easier. After applying the lash adhesive (wait a few seconds for the glue to become tacky before applying lashes), hold the strings on each end of the lashes, and starting from the outer corner working your way in, position the lashes and place them as close/comfortably to the lash line as possible. When the lashes are finally positioned and the glue has dried, you place a finger on each of the lashes to hold them in place while you gently pull the strings out of the small loop hole. I think this string application method is worth a try if you find yourself struggling when it comes to applying lashes. This totally could have come in handy back when I myself had a hard time with eyelash application. But since I have finally gotten the hang of applying lashes, I think I will stick to relying on my handy tweezers to do the job for me. These lashes are gorgeous, though, and they look fabulous on. Strip Lash Adhesive: I don't think I have ever cheated on my trusty Duo Eyelash Adhesive, until this one from Kiss came along. 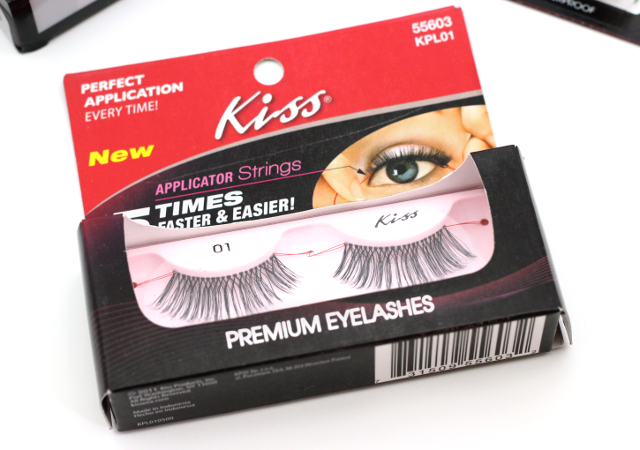 Kiss' Strip Lash Adhesive dries clear, is latex free, waterproof, and odorless. I like that this adhesive comes with an angled wand applicator. It definitely makes application easier, not to mention, mess free. I did notice that this lash adhesive dries a bit quicker than the Duo one, so you need to comfortably position the lashes quickly before the glue dries. With the Duo, you have a little more playing time since the glue doesn't dry as rapidly. Overall, I think Kiss' Strip Lash Adhesive is a nice product that securely keeps my lashes in place all day. A huge thanks to Kiss and Influenster for these fab prize goodies! Which are your favorite Kiss products? Disclaimer: I won the products mentioned from an Influenster/Kiss brand challenge. For more information, please visit my disclosure page. OMG the Gradation polishes look so cool.